1. Should Michael Vick have been suspended from the NFL. if so, how long? 2. Should the Brewers trade Prince Fielder for whatever they can get? 3. Does Lou Pinella come back as the Cubs manager next year? 4. What gratuitously stupid & nonsensical stunt would you do if somehow it would make your team win the World Series/Super bowl? Be as disgusting/creative/stupid as you can be. 5. 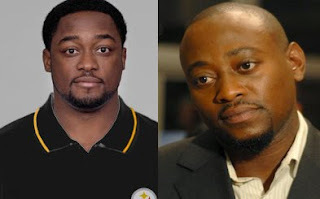 Do you believe that Omar Epps and Mike Tomlin were separated at birth? 4) the most disgusting thing for me would be to wear a Yankee hat for a week or so, just to get the Sox to win the Series...crap, won't do it. 4. That is a thinker. I don't know off of the top of my head.